Fundraising Cookbooks – It’s What We Do! 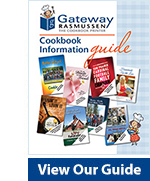 For over 50 years Gateway Rasmussen has been printing fundraising cookbooks for schools, religious organizations, non-profit groups, sports teams, animal shelters, and the list goes on and on. your organization or community to get involved. We have grouped our information and examples into 7 different categories. Please find the group icon that is best suited for you and click to get started!